Our son placed this lunch order when he was six-years-old. 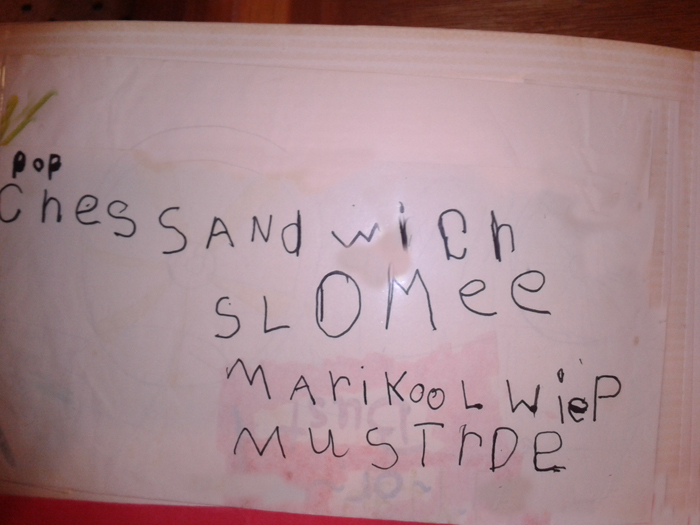 We may have been playing restaurant or I might have been distracted and he was trying to get my attention at lunch time, but whatever the case, it’s unmistakable what he wanted for lunch: pop, ches sandwich, slomee, marikool wiep, and mustrde. Brian and I have laughed and laughed at this. Not only is this just the cutest piece of childhood memorabilia but this “order” is also a mark of genius! With only a kindergarten education under his belt, he sounded out the words and wrote this without any help. Plus it sounds like a tasty sandwich! For a six-year-old this initiative and creativity deserves praise. But, I wonder, at what age would this stop being cute? Barring a developmental or learning disability, no one expects a child to stop learning at age 6. For most children by middle school this note would reveal a failure to learn how to spell. By high school, it would demonstrate disrespect for mom. At what age does it become pitiful? The same questions should be asked about our spiritual education. Becoming a Christian marks the beginning of our spiritual life. We are born again as spiritual babies and have much to learn. Accepting Jesus is the beginning, not the end of our journey. As new Christians we crave understanding of who God is and what salvation means. We must read and study God’s Word, the Bible, to understand all that Jesus accomplished for us on the cross. We must know what we believe and why we believe it. We must learn the wonderful truths of Christianity and we must teach them to the next generation. If you aren’t learning, how can you teach? A marker that we haven’t moved beyond the basic elementary truths is that we don’t understand righteousness. A marker that we don’t understand righteousness is that we continue to think we’re good enough. We think that though we aren’t as good as we could be, we surely aren’t as bad as some other people are. The truth about righteousness is this: apart from Jesus Christ, we have no righteousness. Have you moved into middle school? Do you understand that it was at the cross where Jesus’ perfect righteousness was exchanged for your perfect sinfulness. Are you living in His righteousness? In middle school we just want to fit in, by high school we begin to understand more about who we are and we aren’t afraid to look different. Are you growing in understanding? Are you a different person today than you were when you accepted Christ Jesus? A marker of your spiritual growth is how different you are from the world around you. Just as it becomes pitiful and heartbreaking if a child isn’t growing in academic knowledge, so to it is pitiful and heartbreaking if a Christian isn’t growing in grace and knowledge of Jesus. God’s Word is so rich that we can never grasp it all, but it is so simple that even a child can understand it. Are you continually studying to learn more and more about God? Are you excited to learn that you will never graduate because there is always something more to learn! What To Hold On To? Faith is an ongoing growth walk. And it should be. That was really profound and touched me deeply, Marcia..the best part is we never really finish learning!! Thanks for that reminder..
Pingback: Christian TV » Order Up!